Great 3 bedroom Single Level home with Split Master Bedroom floor plan for privacy. Gorgeous Granite Counters in Kitchen and both Baths. Kitchen has 2 Breakfast Bars, upgraded Appliances, Double Ovens. Master has Bay Window, Walk-in closet. Master bath has Separate Shower and Tub. Tile floors throughout! Back yard has extended Covered Patio, Gazebo, Roses, Citrus and Fruit trees. Patio enclosure can be removed. Air Conditioner HVAC system recently replaced. Pull-down Attic Ladder in Garage. Close to Loop 101 for easy access to all areas of Valley. 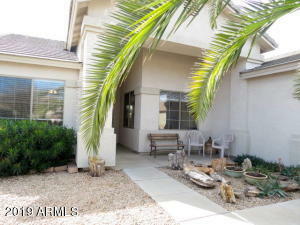 Great location, close to Peoria, Glendale and Surprise area Golf, Restaurants and Shopping. Close to Surprise and Peoria Sports Complex! Nice, Quiet family neighborhood. Minutes to Cardinals Stadium, Lake Pleasant, downtown Phoenix and Sky Harbor Airport.